Bread Bajji, this is an easy and simple tea time snack. When you see some leftover breads at home, then this bajji is one of the best option to make as evening snack. You can make this bajji using different stuffing between the breads like sandwich. But the one I made here is a simple plain bread bajji. I like to taste this with coconut chutney. 1. Take a mixing bowl and add all the items mentioned in the ingredients section except oil. Add water little by little and mix well to make batter. Make sure no lumps are formed when preparing the batter. Add the hot oil and mix well. Adjust the salt if required. 2. 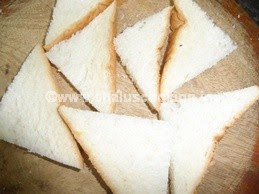 Diagonally cut the bread slices to make four pieces. 3. 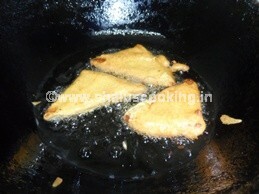 Dip the bread slices in the bajji batter and carefully slide it in the oil one by one. 4. 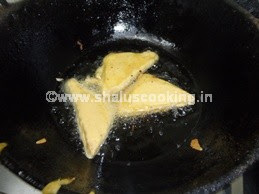 Flip it to other side and cook the bajji till it turns to golden color. Once the bajji is done, drain the oil and transfer it to the paper towel. Easy Bread Bajji is ready to serve with hot tea or coffee. 1. The batter should not be too thick or too watery. 2. Batter consistency should be little thicker than the dosa batter. 3. If you don't like the brown sides of the bread, you can remove it before cutting the slices. 4. You can cut the bread slices in any shape that you prefer. 5. You can make the bajji with stuffing green chutney in between slices. I will try to post this recipe soon.